Matlab makes CPU usage "oscillate"
I find this very weird, and I am not sure whether this happened before the last kernel upgrade. It seems that even when I am not doing anything with Matlab, it uses the CPU cyclically for some reason. 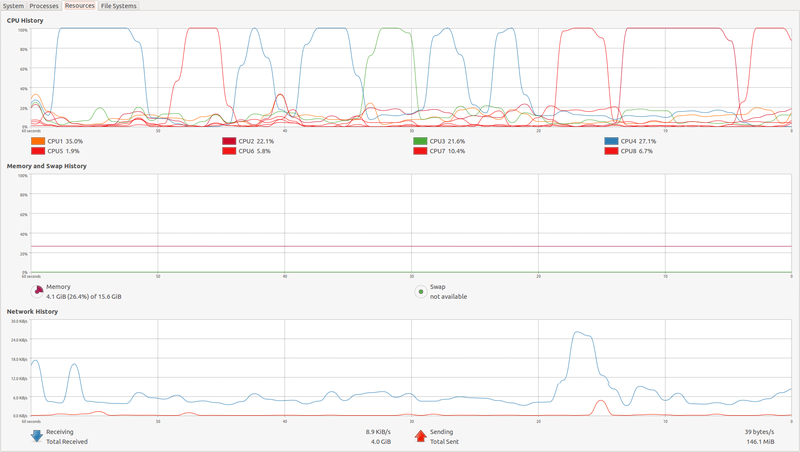 This is quite annoying and it's not just a little CPU time, but I have no idea why this happens and how to make it stop. I am running Ubuntu 12.04 with the latest updates and Matlab R2013a. Is this a known problem? Does anyone know how to make this stop? This has been almost a year now and I would like to know if someone else noticed this and whether there is a solution? I have experienced identical behaviour with Matlab R2014b on Ubuntu 14.04 and OSX Yosemite.